Rhabdomyosarcoma (RMS) is an aggressive malignant tumor arising from soft tissue, commonly seen among pediatric age group and mainly located in the head and neck region. It shows variable clinical and biological behaviors and needs individualized management of the lesion. Management of this neoplasm has a great challenge. Early diagnosis and adopting multimodal individualized therapy provide the best outcome. The treatment options of RMS include surgical excision, radiotherapy (RT), and chemotherapy. However, RT in early life is applied cautiously because of its early and late side effects. Here, we present a case of giant RMS in a 1-year-old child showing a huge mass in the oral cavity and right facial area. He had undergone treatment with RT and chemotherapy. The objective of this case report is to describe a case of an embryonal RMS, where the diagnosis is achievable by clinical, radiological, histopathological, and immunohistochemical findings. Rhabdomyosarcoma (RMS) is a malignant mesenchymal tumor arising from the skeletal muscle cells with varying differentiation degrees. RMS was first documented by Weber in 1854, and it accounts for 6% of all malignant tumors in childhood under the age of 15 years. The head and neck region is the most common location for RMS, with the orbit being the most common primary site. The most frequent site of involvement in the oral cavity is the tongue, followed by soft palate, hard palate, and buccal mucosa. The majority of RMS occurs randomly, without any risk factors, although a small proportion of these tumors are associated with genetic mutations. There are three types of RMS on the basis of histopathology such as alveolar (20%), embryonal (60%), and pleomorphic (20%). Alveolar and embryonal are the most common varieties of soft tissue sarcoma in the pediatric age group. Pleomorphic RMS is commonly found in adults. The pediatric variety often arises in the sinuses, head and neck, and genitourinary tract, sites that contain much skeletal muscle. The treatment of RMS is usually individualized and includes multimodal therapy for patients including surgery, radiotherapy (RT), and chemotherapy. Here, we present a case of giant rapidly growing RMS in the maxillofacial area in a 1-year-old child. 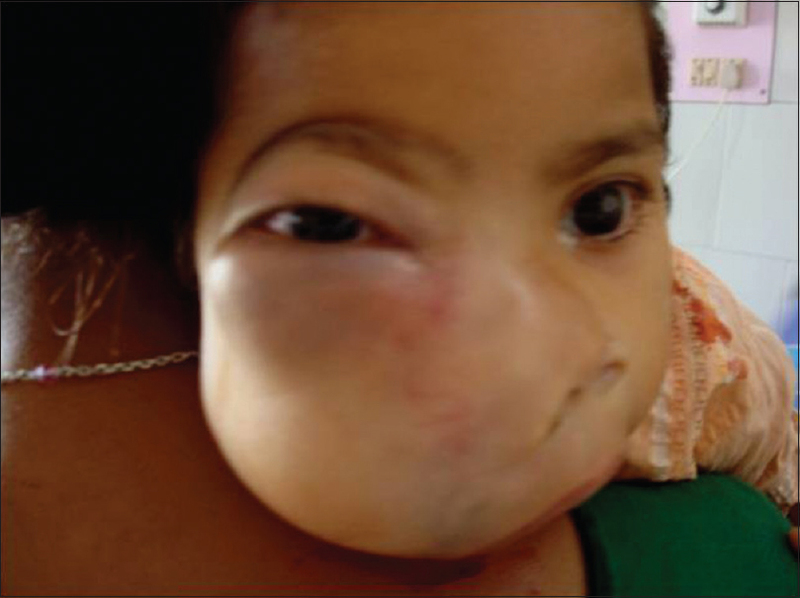 A 1-year-old baby boy presented at the outpatient department of otorhinolaryngology with huge painless mass over the right side of the face [Figure 1]. During the past 3 months, it rapidly increased to the present size (12 cm × 10 cm × 8 cm). He was facing difficulty in sucking mother's milk and production of voice. On clinical examination, there was a smooth, pinkish ill-defined solid mass approximately12 cm × 10 cm × 8 cm in size extending from the upper alveolar ridge to the hard palate with loosening of teeth. The mass was nontender and firm to hard in consistency. On intraoral examination, a pinkish-colored mass was seen with a smooth surface and fibrous consistency involving the buccal mucosa and buccal aspect of maxillary alveolar ridges. The ear, nose, oropharynx, hypopharynx, and larynx were normal. The tongue was not involved but was not freely mobile. Computerized tomography (CT scan) showed a large lesion involving the maxillary sinus, zygomatic arch, and infraorbital area with involvement of the skull base region. An incisional biopsy was done, and the lesion was diagnosed as an embryonal RMS [Figure 2] and also showed positivity to desmin and myoglobin stain [Figure 3]. The patient was referred to the Department of Oncology for combination therapy such as surgery, chemotherapy, and RT. He was treated with chemotherapy drugs of vincristine, actinomycin D, and cyclophosphamide. The patient was recovered partially during the initial period of treatment and under observation in the Oncology Department. RMS is an aggressive sarcoma of soft tissue arising from immature striated skeletal muscle. Common sites of RMS are the head and neck region, genitourinary system, and extremities. Although head and neck area is the primary site for RMS, head and neck RMS is very rare. Head and neck sarcoma counts only 1% of all primary neoplasm originating from head and neck region, accounting for 4%–10% of all sarcoma. RMS in the head and neck region is classified into major four histopathologic subtypes which are embryonal, alveolar, pleomorphic, and sclerosing/spindle. RMS is a rare tumor, more common among young male children. The peak age for RMS is between 2 and 6 years. Our patient is 1-year-old child presenting with this aggressive neoplasm. Sarcomas are rare malignant tumor of mesenchymal origin comprising >1% of diagnosed cancers in the USA and about 1% of head and neck cancers among adults. More than 50% of the head and neck malignant neoplasms in children are soft-tissue sarcomas and lymphomas. RMS in the head and neck region is classified into two types such as parameningeal (including nose, nasopharynx, paranasal sinuses, mastoid, infratemporal, and pterygopalatine fossa) and nonparameningeal (include orbit, scalp, parotid gland, oral cavity, oropharynx, and larynx). The most common sites in the oral cavity affected by RMS are tongue, palate, and buccal mucosa. In our patient, maxillary alveolar ridges were involved. Hence, the exact primary site could not be determined to any fixed location in the head and neck region. The clinical presentations of RMS vary from a simple skin nodule on the face to an extensive and fast-growing swelling on the face. It often presents as a painless swelling, paresthesia, trismus, facial palsy, ear, or nasal discharge. This wide variation of clinical presentations may cause misdiagnosis of the lesion. Embryonal type of RMS in children may cause frequent misdiagnosis in the head and neck region. The diagnosis of RMS is often made late due to its initial nonspecific manifestations and misinterpretation of the microscopic picture. Nowadays, immunohistochemistry, CT, magnetic resonance imaging, positron emission tomography-CT, electron microscopy, and molecular genetic assessment are major options for the diagnosis of RMS. The embryonal variety is seen in 70% of the cases of RMS. Embryonal type is characterized by a mixture of pleomorphic and skeletal immature muscle cells, the so-called rhabdomyoblasts. These cells have characteristic eosinophilic rich cytoplasm and proliferate in a myxoid loose stroma. For confirmation of diagnosis, biopsy is must. Microscopical picture sometimes shows striations in the muscle cells or rhabdomyoblasts. Final diagnosis is obtained through immunohistochemistry or cytogenetic methods. Staining for desmin, myoglobin, and specific muscle actin is proportional to the rhabdomyoblast differentiation. Histopathologically, it is difficult to differentiate this lesion from neuroblastoma, round-blue cell tumor and extraosseous Ewing's sarcoma. For getting accurate diagnosis, newer techniques such as cytogenetics and immunohistochemical analyses are essential. The biological behavior of RMS is classified into four distinctive types (Groups I–IV) by the intergroup RMS study. Group I has better prognosis, whereas Groups III and IV have the worst prognosis. Approximately 50% of patients with RMS die after chemotherapy or 1 year following emission of histological diagnosis. The diagnosis of RMS is based on clinical features, imaging, and histopathologic and immunohistologic grounds. The clinical behavior of RMS is highly aggressive and its outcome is dismal. Although the most common site of metastasis in RMS is lungs, our case had no such findings. Previously, surgical excision was the only treatment option for RMS. However, nowadays, combination therapy such as surgery, RT, and chemotherapy has a significant role in the treatment of RMS. However, it has a poor prognosis due to late diagnosis, metastasis, inoperability, and local recurrence. The survival rate is very poor in early childhood. However, with development of new modality of treatment, survival has improved remarkably to 5-year disease-free survival rate between 41% and 81% for advanced and early phases of diseases. The case presented here is unique in respect to the clinical appearance, location, and giant size. The clinical and biological behavior of RMS varies widely. The clinical presentation of this case is highly aggressive, and the eventual outcome of this lesion is often fatal. Immunohistochemistry and advanced cytogenetic analysis help in the accurate diagnosis of this lesion. Treatment is primarily based on extent of disease. Multidrug, multicycle intensive chemotherapy along with RT, and wide surgical resection has shown improved survival of head and neck RMS. Al-Khateeb T, Bataineh AB. Rhabdomyosarcoma of the oral and maxillofacial region in Jordanians: A retrospective analysis. Oral Surg Oral Med Oral Pathol Oral Radiol Endod 2002;93:580-5. Stuart A, Radhakrishnan J. Rhabdomyosarcoma. Indian J Pediatr 2004;71:331-7. Ricard F, Cimarelli S, Deshayes E, Mognetti T, Thiesse P, Giammarile F, et al. Additional benefit of F-18 FDG PET/CT in the staging and follow-up of pediatric rhabdomyosarcoma. Clin Nucl Med 2011;36:672-7. Moran N, Bhuyan UT, Gogoi G, Gohain M. Giant sclerosing oral rhabdomyosarcoma-A unique case. Indian J Otolaryngol Head Neck Surg 2016;68:384-6. Dasgupta R, Rodeberg DA. Update on rhabdomyosarcoma. Semin Pediatr Surg 2012;21:68-78. Zhu J, Zhang J, Tang G, Hu S, Zhou G, Liu Y, et al. Computed tomography and magnetic resonance imaging observations of rhabdomyosarcoma in the head and neck. Oncol Lett 2014;8:155-60. Barosa J, Ribeiro J, Afonso L, Fernandes J, Monteiro E. Head and neck sarcoma: Analysis of 29 cases. Eur Ann Otorhinolaryngol Head Neck Dis 2014;131:83-6. Hisaoka M, Nishio J. Elastofibroma. In: Fletcher CD, Bridge JA, Hogendoorn PC, Mertens F, editors. WHO Classification of Tumours of Soft Tissue and Bone. 4th ed. Lyon: IARC Press; 2013. p. 53-4. Farias TP, Son PC, Dias FL, Rangel LG, Camara MV, Peryassu BC, et al. Effectiveness of surgical treatment in soft tissue sarcomas of the head and neck. Rev Bras Cir Head Neck 2008;37:51-5. Radhakrishnan R, Suhas S, Kumar RV, Krishnanand G, Srinivasan R, Rao NN, et al. Plasmablastic lymphoma of the oral cavity in an HIV-positive child. Oral Surg Oral Med Oral Pathol Oral Radiol Endod 2005;100:725-31. Wu Y, Li C, Zhong Y, Guo W, Ren G. Head and neck rhabdomyosarcoma in adults. J Craniofac Surg 2014;25:922-5. Durve DV, Kanegaonkar RG, Albert D, Levitt G. Pediatric rhabdomyosarcoma of the ear and the temporal bone. Clin Otolaryngol Allied Sci 2004; 29 (1): 32-7.